As anyone who’s interested in a free culture knows, copyright law has been getting more and more restrictive over the past 100 years or so. When an author published a book one hundred years ago, she enjoyed the exclusive right to reproduce her work and distribute it for a maximum of 42 years. Less, if she did not jump through all the red-tape hoops of renewing copyright after the initial 14 years, and again after 28. The copyright acts of 1831 and 1909 amended copyright law, extending it – including for works already published and still under copyright – from 28 years prior to 1831 to a maximum of 42 and then 56 years. This trend of extending the protection of copyright has been going on ever since, with the latest being the copyright act of 1998, which extended the duration of copyright to 95 years. So copyright has been getting increasingly extended, and while 200 years ago you would have had monopoly on your work for a maximum of 28 years, today it’s four times that, and encompassing more types of intellectual property. But I would like to argue that over the past 100 years alone, copyright has become over eight times as restrictive. How? Because I don’t think measuring the length of copyright in years is of as much meaning as measuring it in man-years, and the population is growing constantly. Man years, in respect to copyrighted works, represent the number of opportunities you have to sell your content to the public and return your investment in it.. Alternately, you can think of it as the opportunities the public has to buy and consume your work. If you have enough time to read two books a month, you’ll consume two books. If the population is one person, only two books will be consumes. If it’s a million, then two-million books will be consumes. I’m ignoring, for the sake of these calculations, the fact that over the past two centuries a greater percentage of people have become literate, and thus potential consumers of intellectual works of art. In addition, the cost of distributing your content and exposing it to a larger number of people has dropped significantly on a per-person basis. These two facts further strengthen my point, but I’m leaving them out, for the sake of simplicity. What this all means: If I were to publish a book in 1800, I’d have a consumer base of 5 million people in the US (Let’s pretend everyone is literate and has a B&N or Amazon in their little town). At the time of the publication, copyright law would give me 28 years to sell my book, and thus – adding up the number of people in the US for the next 28 years – My book is under copyright for a total of 230 million man-years. that’s 230,000,000 man years in which no-one is allowed to do anything creative or transformative with my work. It’s now 1900, 100 years later. There are now 76 million US citizens. At the time of writing my new book, copyright would offer me 42 years of monopoly. I take this into account when deciding to publish my book, and conclude that this is adequate time to recoup my investment. Fortunately for me (or not? ), just 9 years after publishing my book, the copyright act of 1909 come round, and gives me an extension on my copyright, so that now I have monopoly on my book till 1956. Over these 56 years, two world wars will occur, and 6.5 billion man hours will go by in the US, all without the right to do a thing with my book. Yes, that’s 30 times more restrictive than a century ago. Fast forward to the year 2000. It’s a whole new millennium, and I’m producing a documentary movie about book publishing in the early 1900s. It’s a fascinating topic and I have hands-on experience. US population is above 280 million people, and (assuming copyright does not get extended again during the next 90 years), Americans will have 43 billion man years in which to watch my 90 minute movie. All proceeds go to me. Copyright law is meant to strike a balance between the interests of publishers creators and of the general public. That balance, in 1790, meant that an American publisher had the right to deprive the public from free access to a work he owned for 171 million man-years, during which he would try and sell his works and gain a profit off of them. 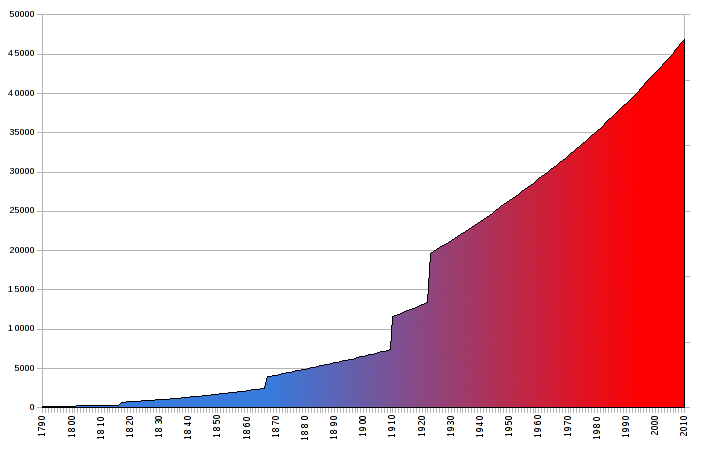 200 years later, with the growth of the population, that same author can recoup his investment so much faster. You’d think copyright term would actually be shortened. 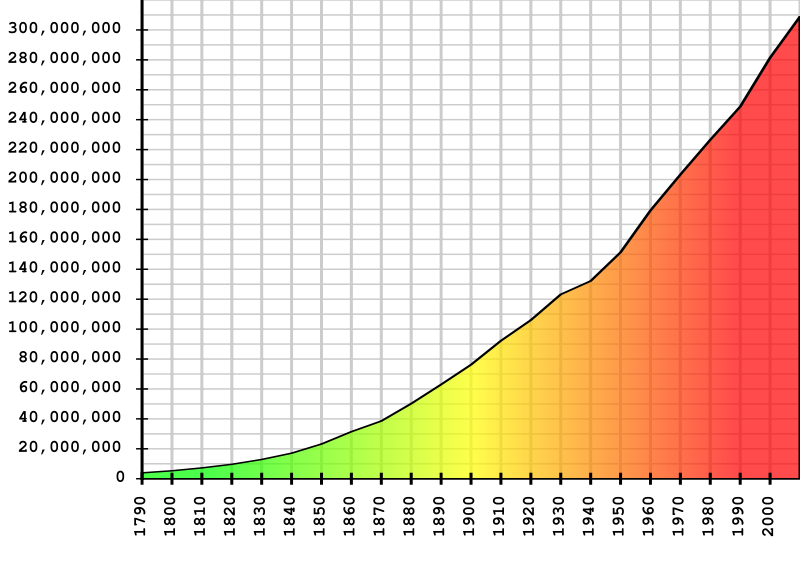 But in fact, with the US population growing 100 fold in the past 200 years, and copyright term getting quadrupled over that time, we are now 300 times more restricted then we would have been six generations ago. I think we’ve been short-changed out of our culture far more than anyone ever realized, and it’s time to bring copyright law back into balance. Be the first to comment on "Measuring copyright duration in man-years, the only way it really matters"